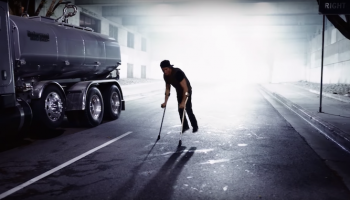 Real time dancemaking in West L.A., filtered dance downtown, reverence and revelry in East L.A., Russian ballet with a Spanish knight errant in Costa Mesa, dancing that gives back in Lincoln Heights, joy and justice through urban Latin dance in Long Beach, and more SoCal dance this week. 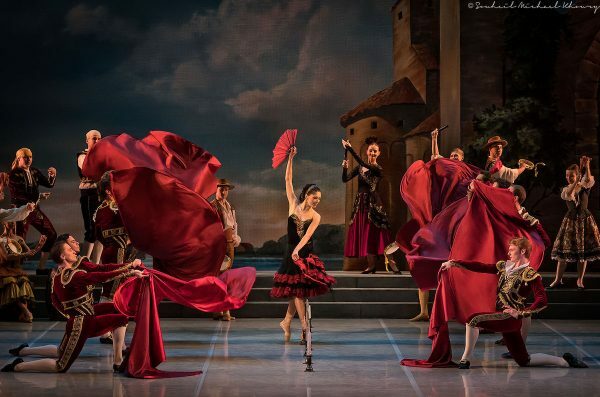 The full-length ballet Don Quixote has little more than a nod here and there to the Cervantes classic. The errant knight and his sidekick Sancho Panza wander through the action and the Don tilts at a windmill, but the main plot involves an innkeeper’s daughter Kitri who loves the barber Basil while her father wants to marry her off to an old rich merchant. The Mikhailovsky Ballet offers four performances, with international superstar Ivan Vasiliev as Basil on Friday and Saturday nights. The Mikhailovsky Orchestra performs the engaging Ludwig Minkus score. Segerstrom Center for the Arts, 600 Town Center Dr., Costa Mesa; Fri., Nov. 9, 7:30 p.m., Sat., Nov. 10, 2 & 7:30 p.m., Sun., Nov. 11, 1 p.m., $29-$189. https://scfta.org. Mikhailovsky Ballet’s “Don Quixote”. Photo by Michael Khoury. This artist-run gallery collaborated with choreographer Katherine Cowgill and video artist Ida Islas in the site-specific Filtered Projections. Dancers include Jessica Gadzinski, Stephanie Kim, Derek Schiesel and Baden Silva. Both Cowgill and the producer Kate Highstrete are alumna of Los Angeles Ballet, now spreading their own wings on the L.A. dance scene. Tiger Strikes Astroid, Bendix Building, 1206 Maple Ave, 5th Floor, #523, downtown; Sat., Nov. 10, 7:30 & 8:30 p.m., no charge. http://www.tigerstrikesasteroid.com. Katherine Cowgill’s “Filtered Projections”. Photo courtesy of the artists. An open rehearsal with Clairobscur Dance artistic director Laurie Sefton offers a first look at a new work described as considering individual identity mapping and the larger context of cultural legacy. The event also offers wine, appetizers and what promises to be an appetizing discussion with Sefton and Victoria Vasta who is collaborating on the vocal score accompanying Clairobscur’s splendid dancers. Los Angeles Ballet Center, 11755 Exposition Blvd., West L.A.; Sun., Nov. 11, 3 p.m. $40. https://www.brownpapertickets.com/event/3657238. 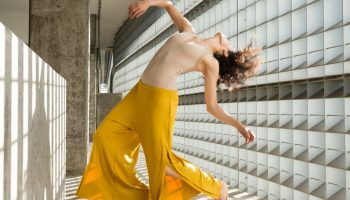 Anyone who missed the premiere of CONTRA-TIEMPO’s latest joyUS justUS earlier this year at USC’s Bovard Auditorium has another chance. Choreographer Ana María Alvarez and the dancers of this L.A.-based urban Latin dance company are joined by East LA band Las Cafeteras providing live music. Carpenter Performing Arts Center, Cal State University Long Beach, 6200 Atherton St., Long Beach; Sat., Nov. 10, 8 p.m., $50. 562-985-7000. http://www.carpenterarts.org. CONTRA TIEMPO’s “joyUS justUS”. Photo courtesy of the artists. Deborah Brockus is the prime mover behind the L.A. Dance Festival and her own contemporary company BrockusRED which for the past three years has hosted the local dance community’s charity event Dance Back with 100% of the proceeds donated to a designated charity or non-profit. This year’s participants include Maura Townsend’s PROJECT21DANCE, Nancy Evans Dodge Dance Company, Sean Greene, Fuse, Lindsey Lollie, Leah Hamel’s Carpool Dance Collective, Luke Zendar, Charlotte K. Smith and the host company. Past recipients include Doctors Without Borders (2015), Family Rescue Center (2016 ) and Doctors Without Borders/International Rescue Committee (2016). This year the ACLU and the Good Shepard’s Women’s Shelter will benefit. Whatever finally happens when the dust settles on the midterms, the ACLU will undoubtedly be going to court or paying for current court cases challenging voter suppression efforts Kansas, Georgia and North Dakota. This annual event has become way to channel the energy of the local dance community and its audience to dance and give back. Entry is an on-line donation to https://action.aclu.org/teamaclu/campaign/danceback-2018 or a donation for the shelter is being brought to the show, advise which donation when making the required reservation at Brockus.DanceinLA@gmail.com are required. Brockus Project Studios, 618B Moulton Ave., Lincoln Heights; Sat., Nov. 10, 8 p.m., Sun., Nov. 11, 6 p.m., donation. www.BrockusProject.org. Dance Back’s BrockusRED. Photo by Denise Leitner. The animated film Coco broadened public awareness of Dia de Los Muertos (Day of the Dead) with its combination of reverent remembrance of forbearers and a solid dose of revelry, perhaps fueled by heightened appreciation of being alive. Now in its 17th year, Gema Sandoval and her Danza Floricanto/USA offer a most polished combination of reflection and jubilance. Floricanto Center for the Performing Arts, 4232 Whiteside St., East L.A.; Sat., Nov. 10, 8 p.m., Sun., Nov. 11, 3 p.m., $30 pre-sale, $35 at door. 323-261-0385. http://www.danzafloricantousa.com/store.php. Danza Floricanto/USA’s “Dia de Los Muertos (Day of the Dead)”. Photo by Frank Sandoval. Backed by a live swing band, the dancers and singers of In the Mood recreate the swing era of WWII. Cerritos Center for the Performing Arts, 18000 Park Plaza Dr., Cerritos; Sun., Nov. 11, 2 p.m., $35-$70. http://www.cerritoscenter.com. 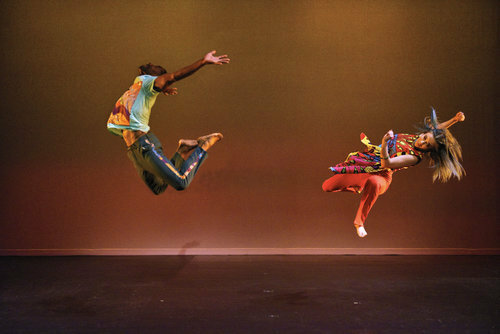 Several generations on from the original group of modern dancers who introduced gymnastics into modern dance, Pilobolus is still going strong. The troupe arrives with Come to Your Senses. Musco Center for the Arts, Chapman University, 415 N. Glassell, Orange; Wed., Nov. 14, 7:30 p.m., $25-$55. http://muscocenter.org. Pilobolus. Photo courtesy of the artists. Works by Kitty McNamee, King Charles, Nina McNeely, Tracy Phillips, Gustavo Vargas, No)one Art House, WeWolf & Ryan Spencer are featured in Congress. Sweatspot, 3327 Sunset Blvd., Silver Lake; Fri., Nov. 9, 8 p.m., $25. www.thesweatspotla.com.